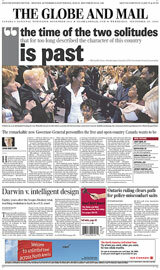 There’s some good news from Canada today in the form of the swearing in of its 27th Governor-General, Michaëlle Jean. Her appointment appears to have struck a chord with many Canadians, whose vision for their country’s future includes many of the principles and values personified by this new head of state. Canadians seem to be celebrating this appointment as though it really mattered, as though the Governor-General were something other than merely the Queen’s representative, the titular commander of the armed forces, a cutter of ribbons and a deliverer of clichéd speeches whose powers are held mostly in reserve. Why? In part it is because she is not a politician. Her job, by definition, is to remain above the gritty, grubby business of governing this messy federation. But there’s more to it. Not since the 1960s have our political leaders seemed so irrelevant, so disconnected. Then, it was a society of youth seeking to demolish outdated moral and social strictures. Today it is a society of immigrants seeking to create the world’s most cosmopolitan society. Then they turned to Pierre Trudeau. Today they turn to . . .. There is no one to turn to. But here is this beautiful young Canadian of Haitian birth, with a smile that makes you catch your breath, with a bemused older husband by her side, and a daughter who literally personifies our future, and you look at them and you think: Yes, this is our great achievement, this is the Canada that Canada wants to be. And suddenly, the arguments of the nationalists and the sovereigntists and the fire-wallists, of the alienated and resentful and estranged, are so tired, so yesterday, that you just don’t want to have to listen to them any more. Yes, indeed. French and English stop your quarreling. It just doesn’t matter any more. The BBC is reporting that John Lennon’s widow, Yoko Ono, has topped the US dance chart at the age of 71 with a song supporting gay marriage (see Yoko’s gay wedding song is US hit). I can’t understand how George W. Bush can argue that he’s in favour of greater freedom for people when he “wants to change the US constitution to specify that marriage can only take place between a man and a woman”. Thirty-seven years ago while Justice Minister, a famous Canadian communist declared “There’s no place for the state in the bedrooms of the nation“. The left-wing Liberal Pierre Trudeau was in favour of freedoms that the current “leader of the western world” is unwilling to give his own nation. It seems to me that the people who talk most about freedom, are really opportunistic control freaks who disguise themselves as liberals (i.e. freedom fighters) whenever it helps their selfish cause. Things are not what they seem, and anything goes! PS – Is dancing allowed in Texas? What makes a great butter tart? Who’d have thought there’d be so much spirituality involved? The BBC has just broadcast a radio play that contains an embarrassing Canadian error. In Harry and Gloria by Katie Hims, Harry is a Canadian soldier awaiting the D-Day landings. He writes a letter to his English lover, Gloria, when the time comes to end their affair. In the meantime Gloria fantasizes about walking arm in arm through the streets of Toronto, including Fourth Avenue and Mel Lastman Square. He doesn’t look that old, does he? Well I don’t know if Toronto contains a Fourth Avenue, but I’m quite certain Mel Lastman Square didn’t exist in 1944. Mel Lastman was only 11 years old that year, and no one could have mistaken suburban North York for downtown Toronto at that time anyway. The English equivalent would be referring to a square in Milton Keynes named after London’s mayor Ken Livingstone! Looks like BBC Drama needs to improve its fact checking. Last weekend Kew Gardens held its sixth annual Woodland Wonders Festival, and fortunately we chose the best day weather-wise to visit. This festival is the one event in the year when Kew opens Queen Charlotte’s Cottage to the public, and so we toured the interior of this former royal garden shed along with thousands of others. It turns out that the building is deceptively narrow; really just wide enough for one room plus connecting hallway. It contains two spacious, opposing staircases (very impractical; not even the royals need two ways to go up and down in such a small space), and upstairs the wallpaper of the largest room was designed by one of the Victorian princesses. Apart from a collection of 18th century framed prints (reproductions) which decorate some of the rooms, the cottage is largely unfurnished. All in all it was pretty underwhelming. Morris dancing at Kew – what’s with those handkerchiefs? On the other hand the rest of the festival was impressive. Many skilled, woodsy folk had set up tents in which they displayed ecologically-friendly activites: bee-keeping, wood carving, archery, etc. A troop of kooky Morris dancers put on several shows, and swings for children were hung from some of Kew’s enormous trees, while free samples of Kew Brew (a premium ale brewed with hops grown at Kew) were handed out to their parents. The plants and flowers were brilliant as usual. Not only were the bluebells all out, but a few of the azaleas and rhododendrons were also in full bloom (many will need another week I think). By far the most spectacular display, however, was put on by the lilacs, most of which were clearly at their fragrant peak; and in the process of admiring them I discovered a strong Canadian connection. British-born Isabella Preston (1881 – 1964) immigrated to Canada at the age of 31 and became one of the world’s foremost lilac hybridists. Working in Guelph, Ontario, she developed lilacs ideally suited to northern climes – late flowering shrubs with prolific blooms. Kew now has several specimens of these eponymous Syringa xprestoniae. All in all, it was an excellent day out. Last week the US Congress scared the living daylights out of Americans by denouncing Canada as a welcoming haven for terrorists (see Terror groups flourish in Canada: U.S. report). There are two Vancouvers – one is a small American town, the other is the large Canadian city. On Monday, a woman from Texas trying to find the small town ended up at the Canadian border. When officials there searched her vehicle, they found a hand grenade in the glove compartment. Within minutes, the border was evacuated and the bomb squad was on the scene. Once the woman explained her story though, things quickly calmed down. A Canadian police spokesman says they are satisfied that the woman was simply lost and had never meant to go to Canada. They soon released her and reopened the border. As for the hand grenade, police say, the woman had no idea it was in her vehicle. I think that makes both countries even. I mean, terrorists or crazy Texans … which would you prefer? Last week I read that Canadians were cool. Now I know it’s true!